To purchase Vacation RentPro, please select the license you wish to purchase below, then click the Add to Cart button. This will take you to the PayPal secure purchase web site. After your purchase, a registration key will be emailed to you which will unlock the limitations in the evaluation software. Any data you have entered will remain. If you do not receive the registration key within 12 hours, please Contact us. Purchase securely using PayPal. (A PayPal account is not required). I have read the Explanations of Features included with each license down below. I understand there are No Refunds. (Please Download the free Evaluation, or call if you have questions). I also understand that Online Bookings integration with HomeAway requires an additional $149/year (see below), and is not included in the License price. Online Bookings integration also requires that you stay current with your annual $89 support/updates renewal, so that VRP can stay current with future HomeAway updates. I have read the Explanations of Updates / Support Renewals, Training, and Upgrades down below. I understand there are No Refunds, and that the Updates & Support Renewal adds 1 year to my Last Renewal expiration date, regardless of when I purchase a renewal. (Explained below). Also, if I am purchasing Training, I understand that any notice to reschedule must be given 24 hours prior to the scheduled time. Otherwise, 1 hour of training will be forgone for rescheduling at a late notice. Please note, sales are final. The free Evaluation is available for your review. Licenses can be upgraded at any time by purchasing a License Upgrade (the difference in price). Please Contact us for additional users and pricing, or any questions. Licenses are based on the maximum number of properties and users that you plan to use the software with, and the features included in each particular license. The number of properties equals the number of separate units you are renting and storing information for. The number of users is the number of different computers and users that will be running the software. Each license includes all features of the lower priced licenses plus the features listed with that particular license. These features are explained down below under each license. Be sure to read which features are included before purchasing. License Upgrades: There is no extra charge for upgrading to a higher license in the future other than paying the difference. However, you must be current with your annual updates and support renewal. To upgrade, select the License upgrade option under "Support and Upgrades" above to purchase the difference in price which corresponds to the difference of what you paid for your current license and the license you wish to purchase. Updates are released regularly. We provide the current version only. If you wish to save previous versions then select "Save" when downloading the software in your browser. Please note: You cannot use older versions of the software after you have updated to a newer version since the database also gets updated to the newer version. The 1 Year of Updates and Support Renewal is based on the month of your original purchase. The first year is free. In order to obtain updates and support, your annual renewal must be current. If the renewal period has expired and you wish to obtain support or update to the latest version, you must pay for any lapsed renewal periods in order to be current. Annual Updates and Support Renewals include support for answering quick questions or pointing you to the appropriate Help topic, (not training). If you need training, please purchase 1 or 2 hours of Training separately above. Updates are cumulative. Therefore, even if you renew 6 months after your last renewal period expired, you are immediately able to download the latest update (which would already include 6 months of updates and improvements to the software). And, you can continue to obtain updates for another 6 months. Please note: If you purchased before December 2008, please see Renewals of Old Product below. Remote Training is available. We connect with your computer for hands-on training using either: our remote training tool, or LogMeIn, Mikogo, or GoToMyPC. This is a good way to get going quickly and introduces you to many features and custom settings in the software. We can also answer questions and demonstrate options available for your particular requirements. Two hours is recommended, which you can purchase above. Please Contact us if you have any questions. Note: Any changes to scheduled training times must be made 24 hours in advance. Customizations to the software can be requested and performed if we agree to the requested change. There is a minimum $250 charge for any customization, since every change must be fully analyzed, tested and documented in the Help. We only consider changes that will be useful to others also, and likewise, changes that others have requested are available to you as well. The software runs under the Windows operating system only. If you wish to run it on a Mac, please see the FAQs page for how to run Windows and VRP on a Mac. The software is not web-based. It resides on your PC or Local network (such as your office or home), and is fully multi-user ready so users can update and view the same information simultaneously. If you require remote access, please see the Web Access page for options. Includes the Base features only. Base features include all features of the software except the ones listed below in the higher priced licenses. Please see Product Info for a list of all features (including Base features and higher priced license features). The Base features still include a rich feature set, including: managing bookings, payments, cleanings and commissions, creating web pages, reporting, owner statements, document and email templates, replying to inquiries, and many others. Property Sharing - This feature allows: Rates, Fees, Amenities and Commissions to be defined once and shared for similar properties. It also allows mixing both shared and specific rates, fees, amenities and commissions for individual properties if needed. This allows for easier maintenance of information across multiple properties. Skype™ and Direct Calling/Texting - This feature allows clicking a button next to individual Tenants, Contacts or Property phone numbers within the application, in order to initiate a Phone call or Text message directly from the Bookings, Tenants, Contacts and Properties forms using Skype or other Dialing / Texting software installed on your PC which uses the "Tel:" protocol. (Requires Skype or other dialing / texting software to be installed). Online Bookings - This feature provides the ability to Interface with either AvailabilityOnline.com or Webervations.com for Online Bookings and Availabilities. Please Click here for more info on this feature. And also check out the "Instant Quotes in Web Calendars" feature below. Lockout Properties - This feature provides automatic blocking of dates for properties that are related in a Parent/Child relationship. For example, two or more adjoining properties which can be rented either separately or "together" as one larger unit, or any combination thereof. This allows for availability calendars and various reporting to accurately reflect the availability of all effected units when any unit in the property hierarchy is booked. These are typically called Lockouts. Payment Processing and Insurance Processing - This feature includes two options for processing credit cards. The first is a direct interface to VacationRentPayment.com (provided you have an account with them). This option includes full ability to process credit card payments, pre-authorizations, refunds, and cancels. We highly recommend Vacation Rent Payment since they offer the absolute best price we have seen, and for their support staff. Please Click here for their contact info. The second option is called "AutoFill". This method automatically fills in your existing web-based payment processing website form (virtual terminal), such as PayPal, PayNet, PPI and some others with the Tenant's credit card info, address, and payment details. Both of these features do Not require an additional monthly fee to us, as is typical with other payment processing software. This feature is also required in order to integrate with Rental Guardian for Travel and Damage Waiver Insurance, which uses the "Auto-Fill" feature in order to automatically populate the details for new Insurance policies. An account with Rental Guardian is required. HomeAway / VRBO™ Full Listing Updates with Online Bookings integration (requires $149/year fee) - This optional feature provides the ability to integrate with HomeAway / VRBO Online Bookings (OLB), where you can directly import bookings made on HomeAway / VRBO sites into VRP, and then charge the guest and process the booking as you normally would if you had entered the booking into VRP manually. It also updates all property details directly to HomeAway / VRBO, including photos, descriptions, calendars, rates, amenities, etc. (a huge time saver). A HomeAwayPM account is required, which is a service of HomeAway for property managers with 5 or more properties, and offers subscribers both "fixed" or "per booking" pricing options. For more info, see HomeAway for Property Managers. This interface is provided by HomeAway / VRBO only to 3rd party "HomeAway Partner" systems, such as VRP. Please note, that this feature requires an additional $149/year fee to VRP Support. This is because it requires an online component that must be maintained and monitored 24/7. Also, the OLB integration feature requires that you are current with the $89/year annual support/updates, so that your VRP software can be kept current with future changes required by HomeAway. Alternatively, if you only wish to only keep calendars updated on HomeAway, you can use the iCal Calendars Export feature in VRP instead, (explained below under the 20 Properties license). RedAwning™ Full Listing Updates and Online Bookings integration - RedAwning is a 3rd party, Channel manager service which allows your listings to be published and integrated with many other sites, including: Booking.com, Expedia, Priceline, Hotels.com, Airbnb, and many others. Note: This requires the same $149/year fee to VRP required for the HomeAway Interface (above). (You only need one $149/year purchase, which will cover both interfaces). This is because the interface uses the same online component required for the HomeAway interface. TripAdvisor™ Full Listing Updates - This feature allows interfacing all property details (including photos, descriptions, calendars, rates, amenities, etc.) from VRP to your TripAdvisor / FlipKey listings. Note: This requires the same $149/year fee to VRP required for the HomeAway Interface (above). (You only need one $149/year purchase, which will cover both interfaces). This is because the interface uses the same online component required for the HomeAway interface. Please note: A TripAdvisor Property Manager account is required, which is a service of TripAdvisor for property managers with 5 or more properties. Instant Quotes in Web Calendars - This feature allows guests to receive an instant Quote while viewing your web Availability Calendars. See Example Here (click on the Calendar menu). Guests can then optionally Reserve or Inquire by email, or Book Online using one of the optional Online Booking Interfaces. iCal Calendars Export to FlipKey / TripAdvisor™, Airbnb™, HomeAway / VRBO, and others - This feature provides the ability to automatically update FlipKey, Airbnb and other Calendars which use the iCal Calendar format. This feature allows Exporting iCal Calendars for selected properties to your own FTP Web Site. iCal Calendars contain availability data and can be imported into FlipKey, Airbnb, Google, Outlook and other calendar products that support iCal format. The FlipKey™ Calendar Updates feature provides the ability to automatically update FlipKey Calendars using your FlipKey account. A FlipKey account is required. Web Auto Updater - This feature allows running a separate process in the background, which automatically updates web calendars and interfaces for all properties at specific time intervals. This helps ensure your online availability information is current and up to date throughout the day. Without this feature you must click the web update options when you wish to perform the updates. Html Classified Ads - This feature allows creating Html Ads for Properties & Property Groups that you can paste into various online classified advertising services. (Note: As of Nov, 2013 Craiglist.org no longer supports Html Ads, so this will not work with CraigsList ads). But it can be used with other similar advertising services which allow Html content in their Ads. All you need to do is Paste the automatically generated Html into your ads which is placed into your Windows Clipboard by the software. The page includes a formatted Ad of your property description, amenities, photos, and links to your own property pages, rates, availability calendar, and online booking form. This feature creates both single Property Ads, or Ads for Groups of Properties, allowing guests to see multiple properties and availability in a single Ad. The Ads are specifically built so that they are compatible with most online advertising sites which typically prohibit use of special html features. "Site" and "Location" Photos - This feature allows Property web pages to display up to 48 photos, (instead of 16). With this feature you can specify the photos (and descriptions) for different sites, buildings, complexes and geographic locations in one place and share them across multiple properties. Therefore you do not need to select and maintain the same photos over and over for each individual property within the same site or location. This also allows you to dedicate the 16 "Property" photos to photos of just the unit or home itself, since you can specify the site and location photos separately. Query All Tables - This feature provides more options for creating queries, reports and data extracts by allowing any and all tables to be included in the Query Designer. Near-Term Automatic Rate Adjustments - This feature helps to drive more revenue and fill open dates which are not booked in the Near Term by automatically adjusting your Rates and/or Minimum Nights based on automatic adjustments you define for specific properties. For example, you can automatically reduce rates by a certain percentage and/or minimum nights for any open days in the next 7 days from today. You can specify multiple adjustments also. For example, you could also reduce rates in the next 8 to 14 days by a different percentage. Any interfaces (such as VRBO, web pages, etc.) that you have set up will also be updated with the adjusted Rates. Multiple Interim Cleanings Scheduling - This feature allows both scheduling, tracking and reporting on additional cleanings if needed, such as Check-in cleanings and periodic Interim cleanings. Note: Scheduling of single Check-out cleanings is included in all licenses. Availability Summary Properties - This feature allows representing summarized availability of multiple properties as a single property. 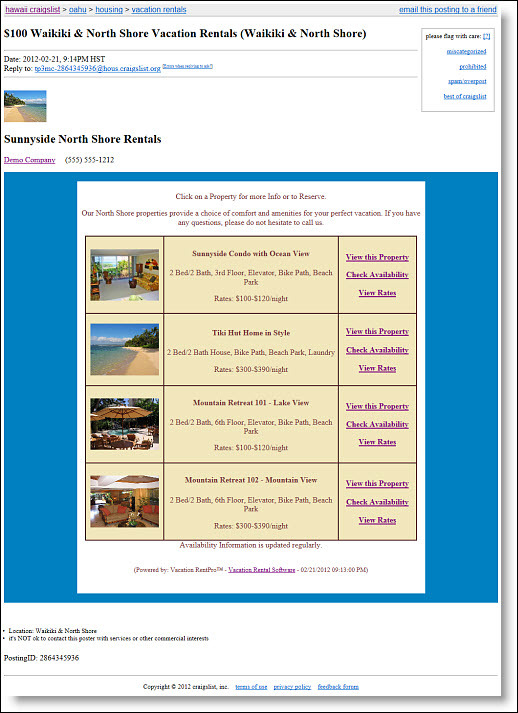 Summary Properties and calendars can be posted to your website and interfaced with HomeAway, FlipKey, etc. This can potentially save money by advertising one property which represents multiple similar properties and having the calendar automatically reflect dates where "Any" availability exist among the summarized group of properties. Owner Timeshares - This feature allows managing and reporting on Timeshares (or properties with Fractional ownership). You can define the periods each owner owns a specific unit, and generate reports for the respective owners based on check-in and expense dates. XML Export - This feature provides the ability to export Available Dates, Rates and Property Information (in XML format), for all Active properties, to your website with the click of a button. The Availability Export can be run separately since Availability information changes more frequently. The XML data can also be used for your own use and custom website if needed. Searchable Web Pages - This feature allows posting Searchable Group Web pages which allow guests to search by available dates, amenities, location, category and other criteria. See Example Here. All web pages allow colors and styles to be customized. Open Days Automatic Rate Adjustments - This feature helps to drive more revenue by filling small openings ("holes") in your future bookings by automatically adjusting your Rates and/or Minimum Nights based on automatic adjustments you define for specific properties. For example, you can automatically reduce rates by a certain percentage and/or minimum nights for all future openings which have 2 or less days. You can specify multiple adjustments also. For example, you could also reduce rates for openings of 3 to 5 days by a different percentage. Any interfaces (such as VRBO, web pages, etc.) that you have set up will also be updated with the adjusted Rates. Checking and Importing External iCal Calendars from third-party sites - This feature can be used to check and compare availability between VRP and other listing sites which offer an iCal Calendar Export ability. In addition, you can optionally specify to Import any blocked dates on the external calendar into VRP as "External Bookings", so that the availability in both systems will be in sync. External Bookings will have no details other than the blocked dates for a given property. You can edit these bookings to add any details if needed. This feature can be useful if you allow bookings on other sites which are not imported into VRP. Custom Alerts - This feature allows defining your own custom alerts which can notify you in addition to the various other alerts (such as Payments due, Cleanings due, Reminders due, etc.). Custom alerts can also be defined to alert you whenever you Save a Booking. For example you can be alerted if you've made a payment on a booking, but have not yet received back the Rental Agreement. 10 Users - please contact us if you require more users. In December 2008 the new product "Vacation RentPro" was released. We continue to honor upgrades and renewals of the previous product "Vacation Rent Pro" for original purchases made since May 2008. For older purchases we will discount and refund your full original purchase towards any new license of $399 or higher so that you will not lose any of your original investment. As with all updates, your annual support must be current. Please call if you have any questions.